A very wet, wild and windy day. The road to Castle Lake is plowed, as of 1330 hours on 01.16.19. 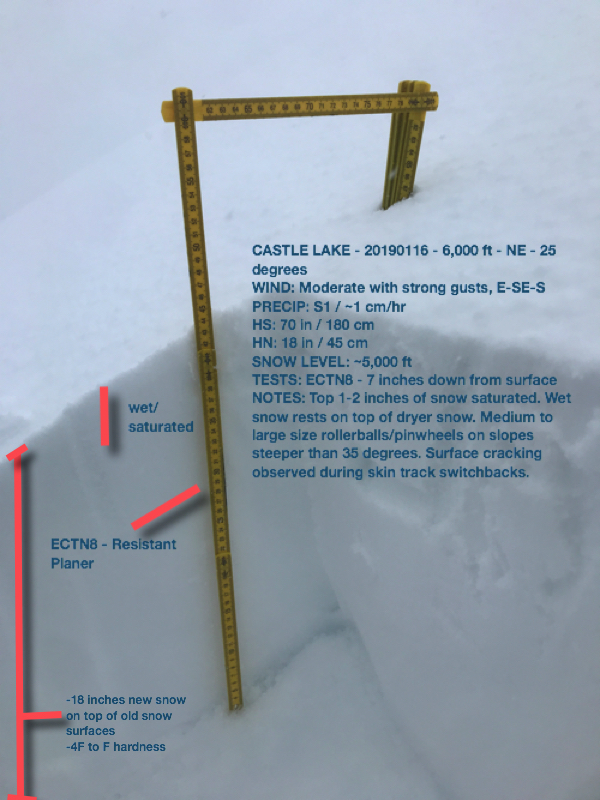 Top layer (1-2 inches) of snowpack heavily saturated and wet at lake level. Lake is still frozen and supportable. Medium to large roller balls were observed on Right Peak, easterly facing, 5,800 feet. Upper Castle Lake (6,000 feet +) hosted dryer snow, albeit still moist. Moderate to heavy precipitation was observed for the entire tour. Accumulation ~1 cm/hour, though snowing/snaining/raining hard at most times. Wet nature of precip prevented better accumulation amounts. Snow level hovered around ~5,000 feet today. Heavy wet snow was observed up to 6,000 feet.